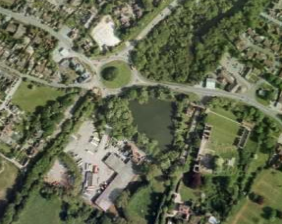 The site was located in Bishop’s Waltham in Hampshire and was irregular in shape covering an area of approximately 4 hectares in total, bisected by a public highway. The northern area of the site was mostly occupied by a pond. The southern area of the site consisted of undergrowth to the east and a former industrial area to the west – the proposed main development of the site was on this area of the site. Significant hydrocarbon contamination was identified on this area of site consistent with its previous industrial usage as a haulage and transport centre which included mechanic’s garages and various industrial units. Detailed speciation of the hydrocarbons indicated the presence of a mixture of weathered petrol and diesel species. Several underground fuel storage tanks were known to have been present which are assumed to be the prime contamination sources. Groundwater was encountered within the near surface alluvium at depths of between 1.4m and 3.0m Analytical results of the groundwater indicated contamination levels of fuel related hydrocarbons exceeding UK drinking water standards by several orders of magnitude. Several receptors were identified comprising of major and minor aquifers, a river and site workers / end users. Envirotreat concluded that it would be necessary to address both the contaminated soils and groundwater on the site. This would provide the necessary protection of both human health and the shallow groundwater and surface water located within the area. A planning application had been submitted  for the erection of a retail store and doctor’s surgery with undercroft car parking, refurbishment of an existing mill building for residential flats and ancillary store uses. In addition, the planning application included associated landscaping and road access improvements to the site.